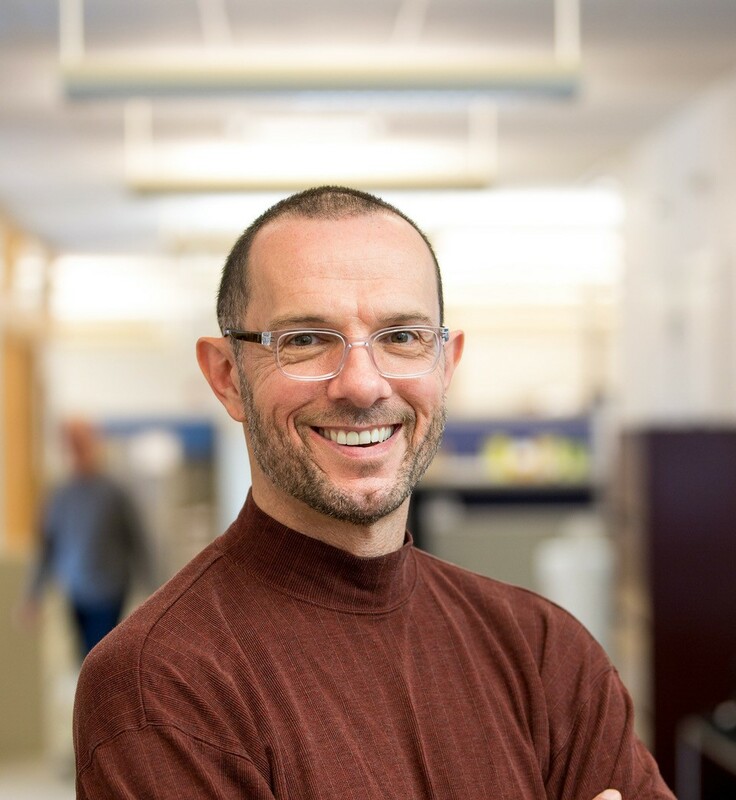 Simon Melov, PhD, heads the Buck Institute’s Genomic Core, which explores the role of the energy-making units inside cells, the mitochondria. Simon’s research focus is in identifying molecular hallmarks of aging to guide the development of anti-aging therapies. Melov received his PhD in Biochemistry from the University of London in the UK. He held positions at Emory University in Atlanta and at the University of Colorado in Boulder before joining the faculty of the Buck Institute as an associate professor in 1999. Other research interests include the age-related bone disorder osteoporosis, age-related heart disease, the role of methylation in the aging human genome, and developing molecular techniques to better understand single cell changes with age. In a landmark study, Melov and collaborators showed that the more vigorous pattern of gene expression found in young adults could be partially restored in older adults who followed a strength training exercise program for 6 months. Near the beginning, Simon talks about the impressive number of muscle biopsies carried out by Dr. Mark Tarnopolsky. The audio drops out for a nano-second when Simon says at least 20,000! What exercise is considered optimal for health-span and longevity? Nice change of pace, to hear some deep science on the subject of fitness. The idea of minimum effective dose is quite popular in the HIT community. No doubt, that is because it is a selling point – you don’t need to devote a lot of time to it. But the evidence seems mostly in the area of building and retaining strength and muscle mass. That is no doubt important. But I remain skeptical that a very short, once per week strength training session is sufficient to meet all fitness needs. There seems to be a growing body of evidence that near daily physical activity, and a weekly minimum volume of physical activity, is really needed for overall metabolic health, even if it isn’t needed for muscle building. IMO it would have been usefull to be more strict concerning the term Exercise. Now it was more a mix of “sport” activity versus normal daily movement. If we think about how most here think about exercise it will be in de direction of intense muscular loading in a safe way. We can from this viewpoint see that, as you Lawrence mentioded, there are few people that can”t exercise. And if the contractions are intense there will be all the benefits from less intense activity that already lead to the benefits. It is Obvious that the environment in the very past was more dangerous and live due to this on average shorter. But there are also opinions that people had the capability to reach a respectable age. That we now live safer can be true (and compared it is true), but many make it self induced “dangerous”.Anyway, here is one thought of myself concerning benefits of activity. If it is true that most got to a age of 30-40 and that they at that time of evolution had to be very active, maybe being active gives the body the “information” of “still being young”. Also regarding mental health I think that it is worth to consider that goal directed moving around needs a healthy brain. Often very precise sometimes very strong muscular activity.The one needs the other so to speak. And my conclusion from this is that finding pharma solutions that mimick some of the muscular activity effect would be worthless, maybe only of benefit for the bed ridden. Suppose we could get this health benefit without exercise, now many more people won’t train their mental toughness and become pathetic humans. The mental thoughness that comes with doing physical hard things has live benefits by itself and can be used in other live areas. Maybe there are genetic traits that lead humans to not being so active. But howmany of them feel this way BECAUSE of their self induced bad lifestyle and eating habits. They bring themselves in a self induced come so to speak. If we notice how many people have a metabolic problem, there also will be many with less impulses to move much. Or?? Theae are just a few thoughts that came to my mind and are NOT a objection to this great podcast and the content. IN NO WAY. Thank you Ad, appreciate the comment. Going outside the HIT community invariably results in some misconceptions around effective exercise. I agree with all of your points, and I think it’s important for the listener to remember that Dr Melov’s focus is on geroscience. He is not a veteran personal trainer or sport scientist, so he simply may not spend a lot of time thinking about the exercise specifically. Equally, it’s important for me to bring people from outside HIT onto the podcast to provide alternative perspectives, and then it’s the listeners responsibility to understand the context and realise that this person may not be as aware of HIT / evidence-based resistance exercise as some of my other guests. Why is my comment removed? I did get a bit of a chuckle when he mentioned that he was a life long vegetarian. I think Lawrence was momentarily rendered speechless by that revelation. Haha I was a little surprised, but my girlfriend is and has been vegetarian since she was 11, so it’s not to hard for me to handle ;-). I’m open minded about diet, I see a lot of evidence and anecdotes of both carnivorous and plant-based diets working well. I just lean towards carnivore since this is my personal preference.